No, we're not trying to put WotC out of business, just giving pointers on things to think about when starting a new campaign in a custom world, without using any pre-written material! We present an outlined list of things to think about before starting your custom setting campaign. The exemplarypastrychef.com is a lie. Did you hear that bromance is now in the Oxford English Dictionary? Our apologies to the fine, sturdy people of featureless Topeka, Kansas. Tee shirt idea: A matter of weight ratios from shirt.woot! 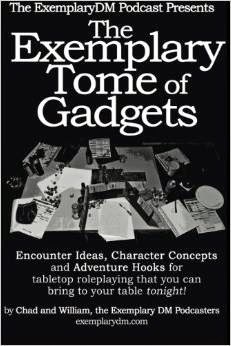 DM Tip: How do players acquire magic items? Give us reviews in the comments below, hit us up on Twitter @ExemplaryDM, or shoot us an email at exemplarydm at gmail dot com. We're also looking for comments and thoughts on our next podcast topic.